As you might expect, this is the second of three reviews on the Friends Animals Collectibles (or whatever it’s called), Series 4. I was on a roll attempting to write this last night, and I had jokes that were funny as heck coming off the top – but WordPress decided to erase almost everything I did. Obviously now I have to start over, and I’ve forgotten everything I’ve written, so it’s not going to be as funny. Curse you, WordPress! 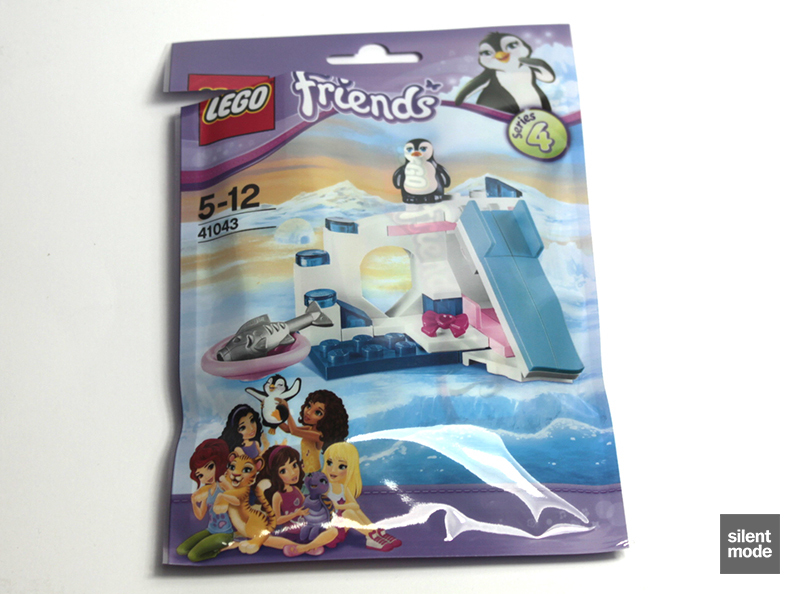 Compared to the other animals in the series, the packaging for Penguin’s Playground looks very bland. I guess it’s to be expected, as the only prominent colour in the Arctic and Antarctic besides White is… Red. Just watch any nature programme. Despite this, you can see I was a bit too eager to get the packet open. I’d even forgotten I was supposed to be doing a review! Much like Tiger’s Beautiful Temple, the back of the packaging shows the alternate build for this set. Notice how the warnings about small parts are far less intense, but still in the usual combination of 936 languages. As expected from the preview, most of the parts in this set are White and Blue – but there are still a couple of gems to be found. Medium Azure tiles are always welcome, but let’s see what else there is. First there are quite a few Trans Dark Blue parts, paying particular attention to the 1×1 bricks, 1×2 plate and 1×1 round tiles. I’m glad they chose Trans Dark Blue over the more common and pedestrian Trans Light Blue, as it certainly makes things more interesting. There’s a fairly uncommon part in White, the 1×2 “bow” (or curved slope) part under the 1×2 slopes. This was a new part introduced this year, and is one of ten sets to include the part in White – although there’s only one to play with here. Expect to see more incarnations of this piece next year, particularly in architecture and vehicle design. 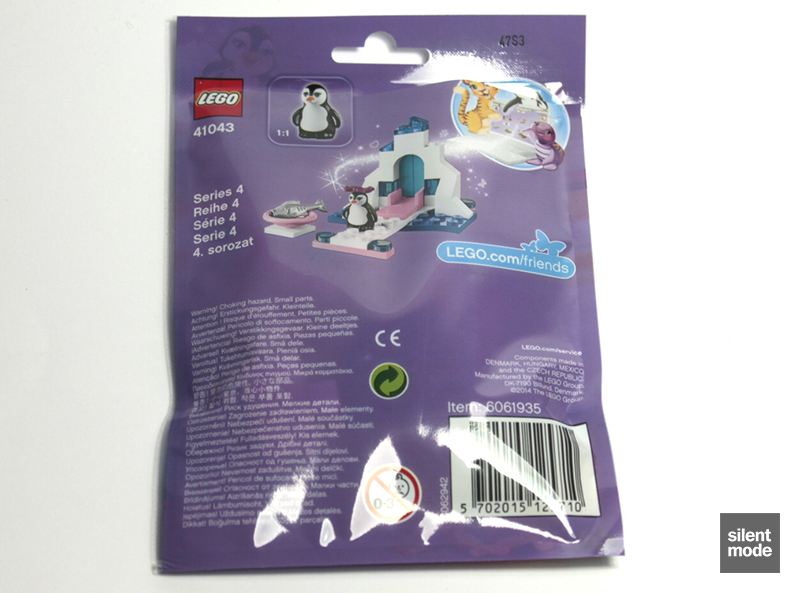 The reason I was so keen to open this set was in anticipation of the penguin, which was a much talked about new animal announced for next year. 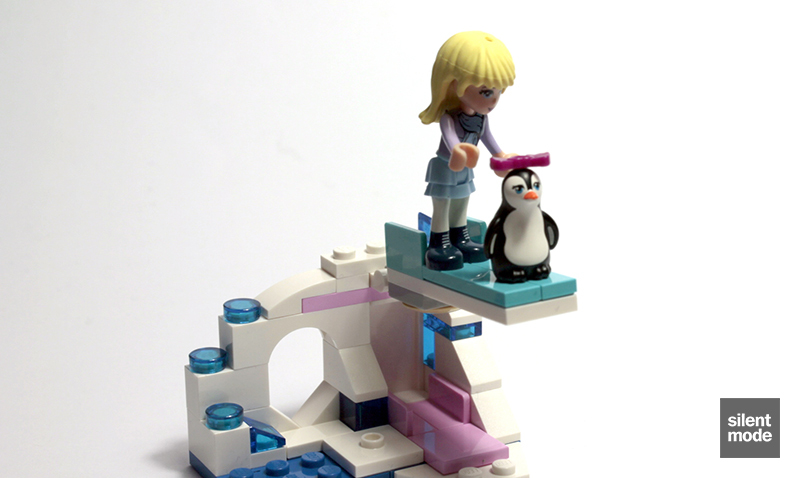 There was a story floating the Internet about the designer of the penguin giving a talk, all while creating the shape of the penguin without looking: this allegedly happened during one of the infamous LEGO Inside Tours. In any case, I’m just glad that the body of the penguin is Black rather than Blue, although I don’t know why I thought it would be Blue. The penguin looks like a genuine fat waddling bird, and can sit comfortably on a single stud, so it’s been designed really well. 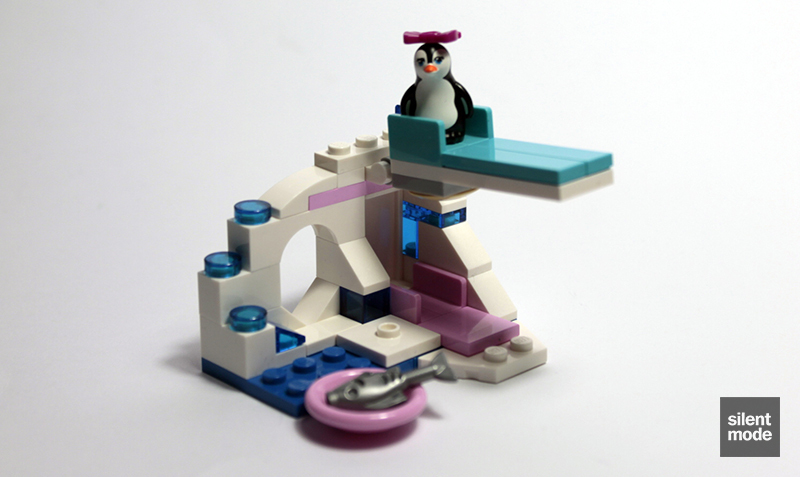 Note that the penguin is a White part with its body painted (as revealed by the base). Of course, the penguin could simply be fabulous. The first few steps of the instructions have you building the foundations of the playground, composed of the two 4×4 Blue plates held together by White parts. The Bright Pink tile and panels interrupt the harmony created by the White and Blues. The 1×2 curved slope (or “bow” if you prefer) comes into play here, after the 1×4 arch in White joins everything. More Bright Pink is added to the top of the landscape. 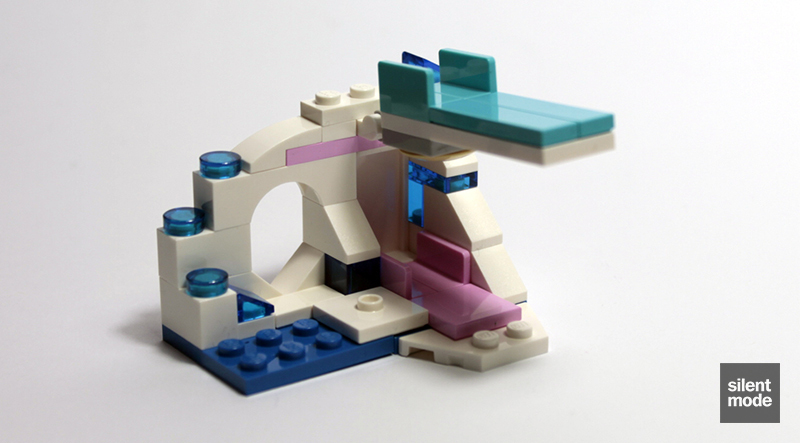 Last but not least, we build the slide (or diving board) from the remaining parts, including the Medium Azure tiles. While this could have been built without the 2x White plate or Tan boat tile, it wouldn’t have been as sturdy. The only thing left to do is add some more Trans Dark Blue elements to show the penguin where to go. 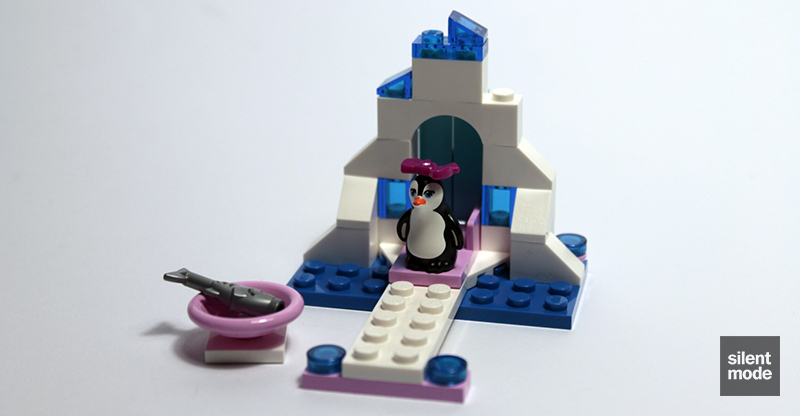 After this relatively easy build, the penguin can be seen frolicking in its natural habitat, having had its fill of fish for the moment. Wanting to be proactive, the penguin makes the waddling trip up the stairs. The penguin then looks around before braving a dive in the cool water. Just like Tiger’s Beautiful Temple, we have exactly five leftovers – the most useful of which, once again, being that 1×1 round tile. This build upped the difficulty in trying to recreate it without instructions, until one figures out how to position the Medium Azure tiles without SNOT bricks. I won’t ruin the surprise. While the set isn’t as aesthetically pleasing as Tiger’s Beautiful Temple, the penguin – if you haven’t guessed – is my favourite of the three animals. The build benefits from having the diving board/slide as a play feature, although once again it serves more as a display piece. I’d suggest that Penguin’s Playground isn’t as alluring a set as Tiger’s Beautiful Temple for parts, but right now it will be the only way to accumulate multiple penguins – which anyone who likes the penguin is bound to do. You may even see it in 2014’s Friends advent calendar. The issue is then: is buying multiples of the set at RRP going to be worth it? Most of the props go to the very well executed penguin. The build and alternate build are okay given the number of parts, with the alternate build posing a more interesting challenge. 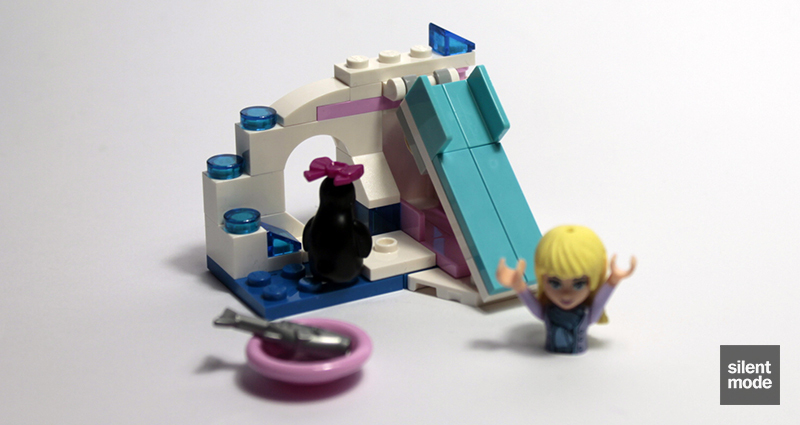 Try building the builds without instructions: a potentially interesting activity for fans of the animals. With instructions the building is fairly straightforward. 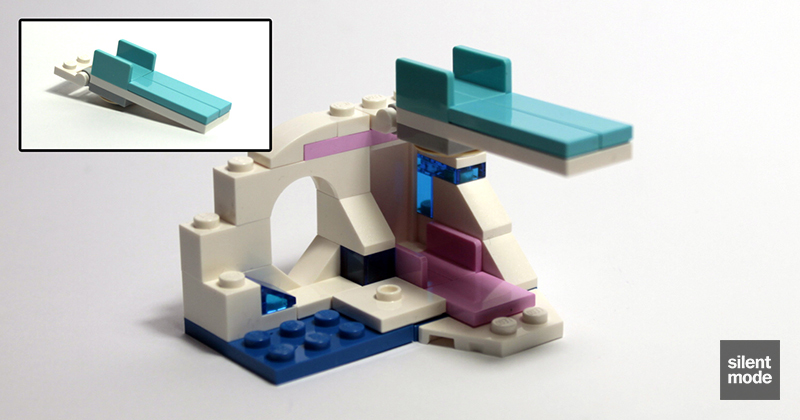 I wonder how the set would have worked with Medium Azure, a Trans Blue or even completely transparent parts instead of Bright Pink. (Then again we have to show that the penguin is female!) The Trans Dark Blue parts are my highlight of the set, besides the featured animal. 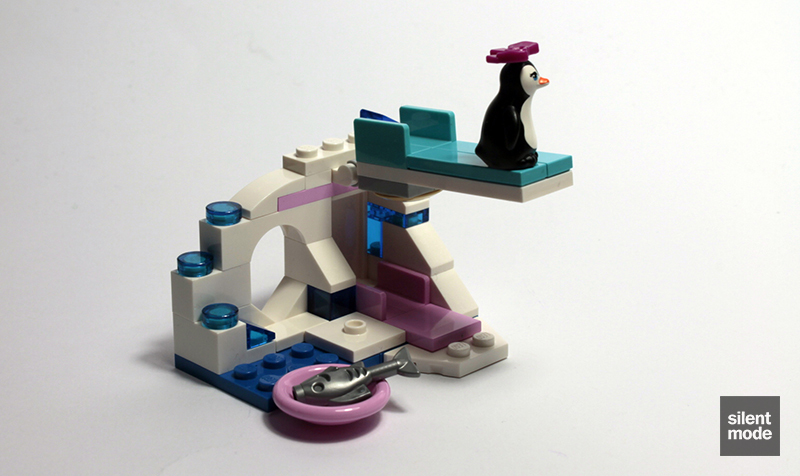 As much playability as can be had with a penguin and this many parts, although unlike the other sets it actually has a play feature. I'd say Tiger's Beautiful Temple is better value at RRP, but definitely pounce on this one if you see it discounted. You'll probably end up paying around the same price for the penguin on its own. So we’re giving the penguin and its crib 7.0/10 based on averages. Go penguin! One more review to go, so stay tuned.